As the barrier between design and fine art crumbles, today’s artist-designers are giving their imaginations free rein. 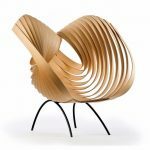 Laura Kishimoto, Yumi Chair II, 2014, ash veneer, steel, 48 x 41 x 47 inches. 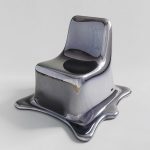 Philipp Aduatz, Melting Chair, Black Chrome Edition, GFRP, special black chrome, 37 x 37 x 31 inches. Ball Nogues, Music Leg Glob Lamp, 2012, sprayed paper pulp and lightbulb, 17 x 17 x 10 inches. 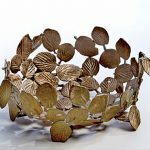 A delicate skein of openwork bronze leaves and branches coalesces to form a bench or a chair. 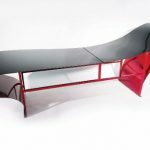 A sinuously curved steel construction coated with auto-body paint is a chaise longue. 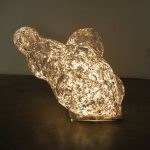 What looks like an asteroid fragment glowing with cosmic rays is actually a floor lamp. With creations like these, today’s emerging designers are playing havoc with the modernist mantra “form follows function”—unless the function is to provide delight as well as utility, to stimulate the imagination as well to support the body. The design scene is being pervaded by a spirit of exuberance and playfulness, and something more—a sense that the traditional separation between design object and work of fine art is arbitrary and obsolete. Thinking of fine art and design objects as being arranged along a spectrum of “functionality and decorativeness” is a good way to make sense of the diversity of today’s design. Toward the far end on the “fine art” side are works such as the ceramics of South African designer Andile Dyalvane, which will be on view in a solo show at the New York design gallery Friedman Benda from June 23–August 19. Some of the pieces have an opening at the top, giving at least a nod to the traditional concept of a vessel, but others are closed, which essentially makes them sculptures. The artist–designer incises the surfaces with patterns that allude to Xhosa ritual scarification, and to express the mixing of cultures in South Africa, some of those marks are made with fragments of 20th-century technological detritus found in street markets. The Friedman Benda show will also include a monumental ceramic-and-wood screen that recalls the forms of skyscrapers going up in Cape Town. Some of the non-functional pieces that are shown in a design context are made by people who come out of the design and architecture worlds and now are being given the chance to create works free from the constraints of function. Cella represents an L.A.-based collaborative team called Ball Nogues, led by architects Benjamin Ball and Gaston Nogues, who formerly worked for Frank Gehry. Known for producing large-scale outdoor installations, they now “take architectural methodologies and design skills and apply them to fine-art work,” says Cella. Some of the pieces have domestic functionality, like the glowing, rock-like floor lamps mentioned above, but others are pure aesthetic expression, like their wall-mounted rectangular pieces made of folded and crumpled strips of steel. These present themselves to the eye as framed abstract pictures, but the materials speak of the construction and thought processes of architecture and heavy industry. The support of dealers who give designers the opportunity to make fine-art pieces has been instrumental in forming and sustaining this trend. Hochman says that at Friedman Benda, “the goal is to work with the designers so they have the freedom to develop new bodies of work. What you’re seeing with all these people is exuberance and energy; that’s what’s driving them. Our collaboration helps them get the freedom and time to experiment and push the limits, to come up with something new and fresh.” Wexler comments that this kind of freedom has been a longstanding need on the part of designers. “A lot of craftspeople always wanted to be in the fine-art world,” he says. “Talk to Wendell Castle—he wanted to be a sculptor. 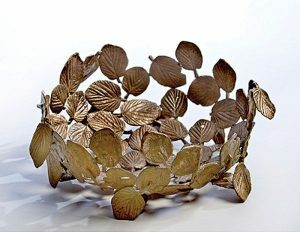 We’re about freeing up artists to create a body of work that doesn’t necessarily have to meet the confines of functionality, giving them the freedom to experiment with many different things.” Occasionally the process goes in the other direction—one of Wexler’s designers, Gregory Nangle, who makes the bronze-leaf furniture, was originally a glass artist and then wanted to do something functional. 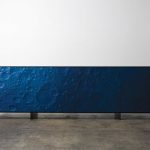 Vivian Beer, who is represented by Wexler, also uses industrial materials and processes. 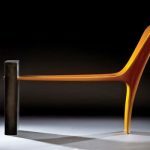 She works with welded steel and automotive paint in what Wexler calls “hot-rod colors” to make innovative pieces of furniture such as her “Anchored Candy” series of chaises longues. She has also made some chairs and benches out of steel tubing and a kind of artificial concrete composite called ferrocement. “She is one of those who bring a certain excitement to the design community,” says Wexler. “She’s incorporating car culture and also fashion.” Beer, who recently won “Ellen’s Design Challenge” hosted by Ellen De Generes on HGTV, spent a good part of 2014 researching the history of American industry, architecture, and transportation with a fellowship at the Smithsonian National Air and Space Museum.